Thanx to the good folks at What Happened in Flat Earth News This week. 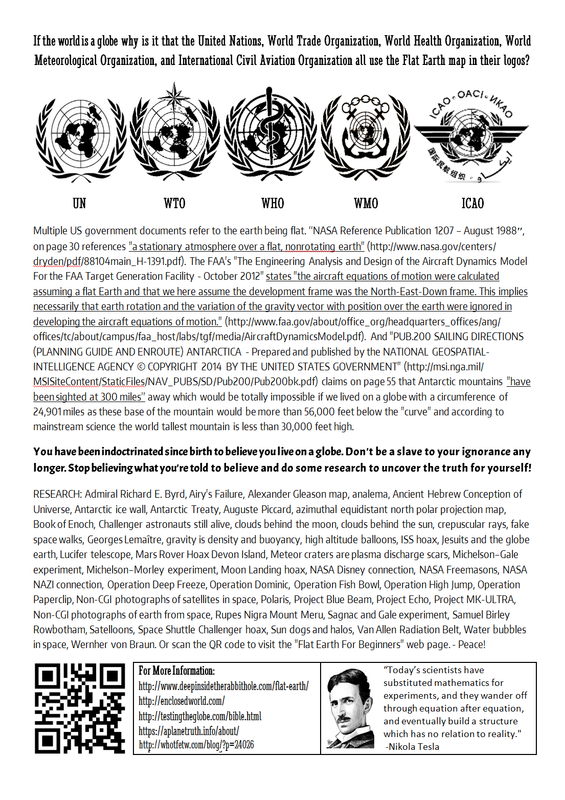 My first attempt at a double-sided A4 flat earth flyer in JPG, PNG, PDF and docx formats. I tried to cram in as much information as possible. Feel free to print them up and hand them out. I’ve included the original WORD file in case you want to make any changes, or simply use it as inspiration to make your own flyers up. The QR code on the back links to the post “Flat Earth For Beginners”. DOWNLOAD: JPG-1, JPG-2, PNG-1, PNG-2, PDF, DOCX, or ZIP of all 3.2MB. ← Mandatory Vaccines For All; Where’s the Outrage?